On forums, users are exposed to traditional banner ad space for a much smaller proportion of their time than on blogs. Furthermore, they’re frequently focused on doing something else (e.g. writing a post or figuring out how a thread has evolved) than when they’re reading a blog. As a result, they are less likely to click on your banner ads even when they see them. This means that forum owners require additional ways to make money on their forums. But, many aren’t sure what else to do, or how to get started. Users have been blind to banners for years, so a lot of forums place advertising posts in between two real posts. The reasoning for this is that people develop a sort-of Pavlovian response to expect ads in traditional advertising areas, such as the banner spaces above the fold, so they do not click on those ads anymore. You should always disclose these adverposts as being advertisements, even though it might be obvious. It’s still a good idea just in case anybody could be confused, and that way you can’t be accused of having underhanded advertisements. The Something Awful forums charge new users $10 to sign up, and it’s a one-time fee. This helps them cover hosting costs and makes it so that existing members don’t have to see ads, which increases the value of off-site advertising such as newsletters. However, recurring subscriptions work too, and they can be especially useful if you have an established forum for experts within a field. These people will be more willing to pay a yearly fee to keep out all the noobs and spammers than hobbyists or enthusiasts who aren’t exactly experts. In-content links are an unobtrusive way to generate additional site revenue and ideally suited to all types of content — including the user-generated content synonymous with forums. And additionally, they are completely complementary to banner ads and [ad-posts]. Plus, unlike banner ads, VigLink ads reach out with forum users when they’re reading the content, instead of before they scroll down to read what they were looking for (like above the fold banner ads). Learn more tips at ForumCon! 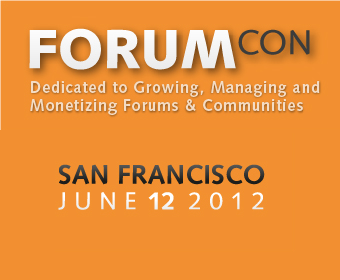 This year’s ForumCon is on June 12 at Hotel Kabuki in San Francisco’s famous Japantown. It’s the only forum convention in the world so make sure to be there to learn more about monetizing your forums, to make connections in the industry, and network with other forum owners and tech people. VigLink is hosting ForumCon and a limited number of tickets are being sold at a special price of $69. More information can be found at the ForumCon website — hope to see you there! This is a guest post by Murray Newlands. Murray is the CEO and Founder of Influence People, an online marketing and PR consulting firm based in San Francisco. This entry was posted on Monday, February 20th, 2012 at 6:07 pm and modified by WebMaster View on Friday, March 21st, 2014 at 8:40 pm. You can follow any responses to this entry through the RSS 2.0 feed. Responses are currently closed, but you can trackback from your own site. Slightly off topic – I don’t think I have ever been served a relevant ad by these in-content, hover-activated bubbles. It could be because “infolinks” largely cater to US/global tech niche rather than to areas like events, home appliances, insurance, autmobile, food and living etc.